For 2010, a moonroof is standard on Nissan Pathfinder LE models, while LE V8 models also get a navigation system. 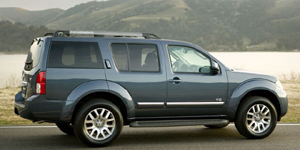 The 2010 Nissan Pathfinder SUV is powered by a base 4.0-liter V6 with 266 hp. Also available is a 5.6-liter V8 with 310 hp. Find the used Nissan Pathfinder of your choice from a dealer in your area. Search our used car listings now.